If you ever need a way to waste 20 minutes and you don’t really want to get up or anything, try to remember the name of the paint on your living room wall. We painted when we moved in, in 2008. We tore down a wall in 2011 and now find ourselves in need of touch-ups. Massive, massive touch-ups. Bob: Do you remember the name of the gray paint? Me: Definitely not. Is it Behr? Bob: Yes. Ancient Stone? Satin or eggshell? Me: No, it definitely had something to do with a river or stream. Eggshell I’d think. We don’t have a can in the basement? 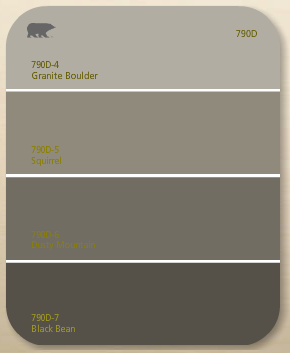 Bob: Would you look on behr.com? They have an interactive thing. I couldn’t find it. Bob: Granite Boulder. It’s Behr Premium Plus. And we have a gallon. I’m an idiot. Me: Me too. I was 100% sure granite wasn’t in the name. Bob: I bought some. I got Dark Granite. Me: We can use it for something. Or return it. Bob: You can return paint? I think what I like so much about our conversations is how confident we can both be and yet be utterly wrong at the same time. It gives me hope in our ability to bluff our way through raising kids. And now you’ve effectively wasted 20 minutes. Congratulations. Thanks for putting a big grin on my face. The scenario you describe, in seemingly infinite variations, is oh so familiar. I enjoyed the post about your nightly kitchen raid conducted by you and your son as well. And finally, thanks for your follow of Heart of Life Poetry, I really appreciate it. I’m glad I could spread a little happiness 🙂 thanks for reading! Aside from being exactly how the conversation would go in our house, this had both me and my husband laughing hysterically. Thank you so much for posting!